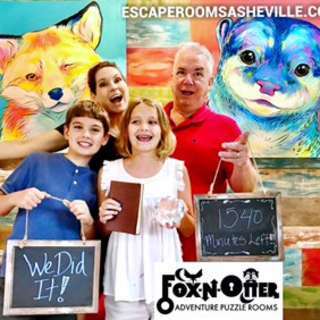 FOX-N-OTTER Adventure Puzzle Rooms are escape room type games for all ages in South Asheville. We have a Youth & Family Room created especially for 8-12 year olds all on their own, multigenerational groups, families and first timers. Our Advanced room has been crafted for older teens and adults perfect for date nights or team building and groups looking for a greater challenge. We are located right above Rocky's Hot Chicken Shack on Sweeten Creek perfect for food and fun with whatever group you are a part.